Fifty two people attended the pump seminars that Ebara Corp held in Bangkok, Thailand from 24–31 August 2017. With a theme of pump technology for the water supply system, Ebara held lectures on determining the specifications of intake pumps in water treatment plants, water hammer prevention and energy-saving operations of pumps. The company also organised a tour of the Phra Khanong Drainage Pumping Station. The 52 participants, mainly engineers, came from Thailand, Vietnam, Bangladesh, Cambodia, Laos, Nepal, the Philippines and Sri Lanka. This was the 27th time that Ebara has held seminars in cooperation with the Asian Institute of Technology (AIT). 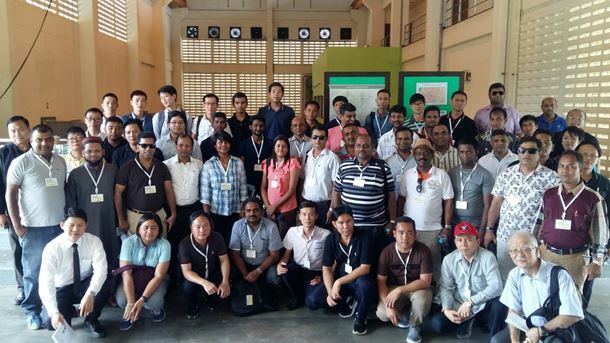 The Ebara pump seminar participants at Bangkok's Phra Khanong Drainage Pumping Station. Ebara Corp has shipped a submersible motor pump with an output of 3350 HP (2500 kW) to a pump station that supplies water to Las Vegas in Nevada, USA.